Siri Hustvedt begins to shake uncontrollably when she delivers a talk in honor of her father two and a half years after his death. She shakes violently from the neck down (her mother later tells her it looked like an electrocution) but manages to deliver her talk without a flaw, her linguistic faculties and facial expression apparently unaffected. The seizure is followed by a few subsequent seizures, followed by an overwhelming dread of more seizures. In what Hustvedt describes as “a quest for mastery” over the foreign assault on her otherwise highly composed, non-anxious, linguistically sophisticated self, the novelist embarks on an intellectual journey in search of a diagnosis. But the questions she asks on this journey soon turn larger and larger, pushing her towards the philosophical: What is the relationship between body and mind? Is there an unconscious? How different are dreams and flashbacks from explicit memories? Is she “the shaking woman,” or is the shaking woman external to her, a double, or a cut-off part of her contained, core self? Need the shaking woman be reckoned with or must she be obliterated with medical treatment? Hustvedt’s deft quest for answers sends her traveling across a slew of disciplines: psychiatry, neurology, psychoanalysis, pharmacology, philosophy, and narrative medicine. She visits each discipline, citing famous case studies and considering a possible diagnosis (Hysteria? Conversion disorder? Repression? Epilepsy? ), then quickly moves to expose the blind spots that fall outside the scope of each epistemological framework. As a non-specialist, Hustvedt (who holds a PhD in English and has published several novels and essays) is the highly intelligent lay explorer who isn’t bound by the yoke of any single discipline or point of view. She allows herself to transgress the boundaries between and within disciplines, traversing not only horizontally but also diachronically to what Foucault had called their “point-zero,” the moment in which neurology is forever dissociated from psychiatry (the first would heal the brain, the latter the mind) and psychoanalysis turns from the science that the young neurologist Sigmund Freud had first envisioned it as into a “talking cure.” This bird’s eye view allows Hustvedt not only to critique the limited scope of the highly specialized disciplines, but also to salvage the reputation of the late nineteenth century giants that have fallen out of favor with the medical establishment: Freud, Janet, Charcot. Freud, Hustvedt maintains, took the fateful turn towards psychological explanations of the mind only after he decided that the knowledge of neural processes available to him at the time was insufficient for developing a biological model of the mind; but the scientific origin of Freud’s thought has been forgotten (repressed?) by practitioners of psychoanalysis, as well as by neurologists and psychiatrists who, exposed to not a word of Freud in the course of their training, are prone to adopt Freud’s popular image as a mystic thinker whose theories emerged out of the decidedly un-empirical air of his imagination. Hustvedt sets out to critique the specialized disciplines but also to make peace between them. She is at her best when she draws original links between seemingly unrelated doctors, patients and theories, situating types of dissociative conditions like multiple personality disorder and traumatic flashbacks side by side, fancying the case of Janet’s famous patient Irene as a precedent to her own case, or identifying the brain-damaged patient at the center of the Russian neurologist A. R. Luria’s The Man with a Shattered World as the unacknowledged precedent to a paper published in a 1994 issue of Brain. Her flexible, wide lens, it is implied, allows Hustvedt to see links that the highly professionalized contributors to Brain cannot. The glue that holds all of this intellectual heavy-lifting together – though occasionally parts do not quite stick – is Hustvedt’s personal story: the progression of her shaking condition, early childhood memories that had shaped her, the history of her migraines, and her relationship both to her deceased father and to her (barely mentioned) mother, the big elephant in the room around which Hustvedt circles but never explores at length. Something of an inherent contradiction underlies this fascinating, challenging and at times moving book, a contradiction which is symptomatic of our age: Hustvedt’s quest into the far reaches of medicine and psychology is driven both by fascination with and a deep distrust of the medical and psychological professions. Reportedly reading Freud since she was sixteen, she has never been in analysis; in lieu of medical attention to her seizure, she visits an imaginary psychoanalyst (summarizing the imagined course of treatment in one paragraph), then an imaginary neurologist, who sends her for an imaginary CAT Scan (no noticeable change in the brain is detected). In place of a doctor Hustvedt reads and reads and reads all those books and specialized journals that once were accessible only to the white robes but are now available at the stroke of a keyboard to a New York based novelist or any grandmother in Texas. When reading fails to bring about a conclusive diagnosis or end the shaking episodes, Hustvedt turns to a psychiatrist “friend”; the friend refers her to a neurologist, who refers her to a pharmacologist, with whom she finally makes an appointment. But then she cancels, choosing instead to self-medicate on the beta-blocker Inderal, which suspends the external shaking but does not alleviate her inner tremor. In the last pages of her memoir, Hustvedt decides to begin analysis, but this is where the book tellingly ends. It is striking in this respect to consider the stark difference between the hermeneutics of suspicion, and the rapid transitions and conjunctures that characterize this work by a contemporary American writer, and the lengthy, painstaking recording of thirty years worth of minute observations, which makes up the Russian Luria’s 1973 study. At times her expansiveness works against Hustvedt: one cannot, after all, read everything (she overlooks, for example, Richard McNally’s recent study of trauma memory, which contradicts much of what she says about fragmented, involuntary memory). At times she also hammers her critique a bit too hard (as when she launches, near the end of the book, an intense critique of constructivism, a dead horse for sometime now). 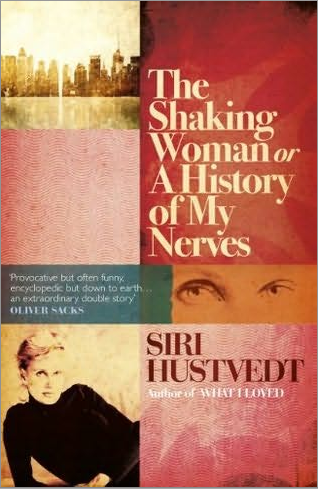 Nonetheless, Hustvedt offers the reader a unique and impressive synthesis of multiple intellectual threads, woven into the story of her shaking with lucid, exquisite prose (“Over time [Freud’s] thoughts about the psychic apparatus would both change and evolve, but he would never be able to sink his theories into the nervous system, where he knew its processes originated”). In passionately arguing for a holistic, humane take on the individual as body and soul, consciousness and unconsciousness, composure and abandon, Hustvedt situates herself within a lineage that dates back to earlier female critics of rationalistic practices like Martha Nussbaum and Patricia Williams, but also, going even further back in time, to Freud and Janet. Terrific review of a fascinating book about the mind/body connection and what it means to be who we are–raises very interesting questions along the lines of The Blue Fire, by James Hillman and the play Equis, about our almost prescribed compulsion to “treat” psycho-neurological “conditions.” How much of who we are do we excise in the name of “normalcy,” or psychic ease of being?